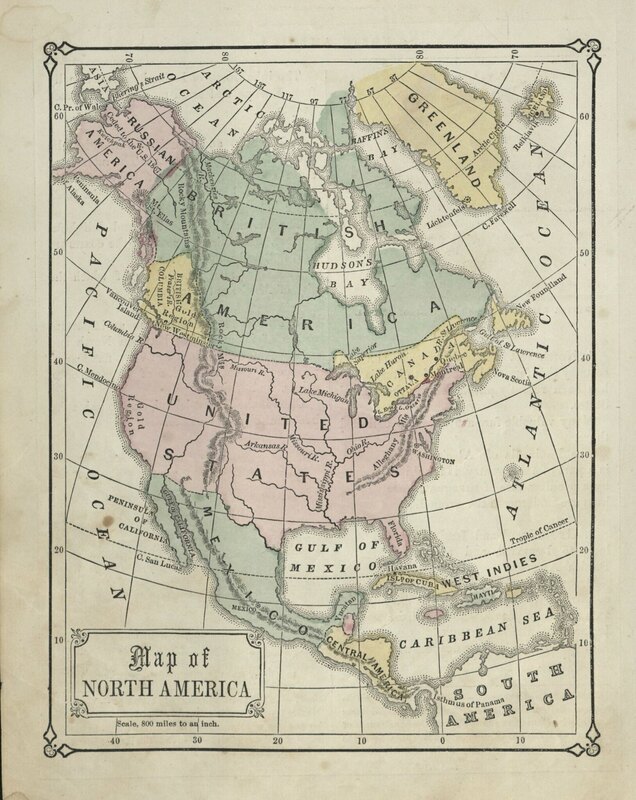 I found this map of North America in a antique store recently, and was going to post it simply because it looked nice and because it refers to Canada as "English America," which seems remarkably apt. Soon after, though, I found another map in a US geography textbook [below left] showing an even more detailed division between Canada and British America. At which point I went back and checked a map we posted several months ago in which much of Canada appears as "New Britain." To figure out what was going on I asked fellow SOAS alum, citizen of the world and lifelong Canadian Laura Clinton. She provided the following guest post, which represents our blog's first serious foray into Canadian history. Ottomanists, meanwhile, are invited to comment on why Turkish so regularly seems to prefer England/English over Britain/British. 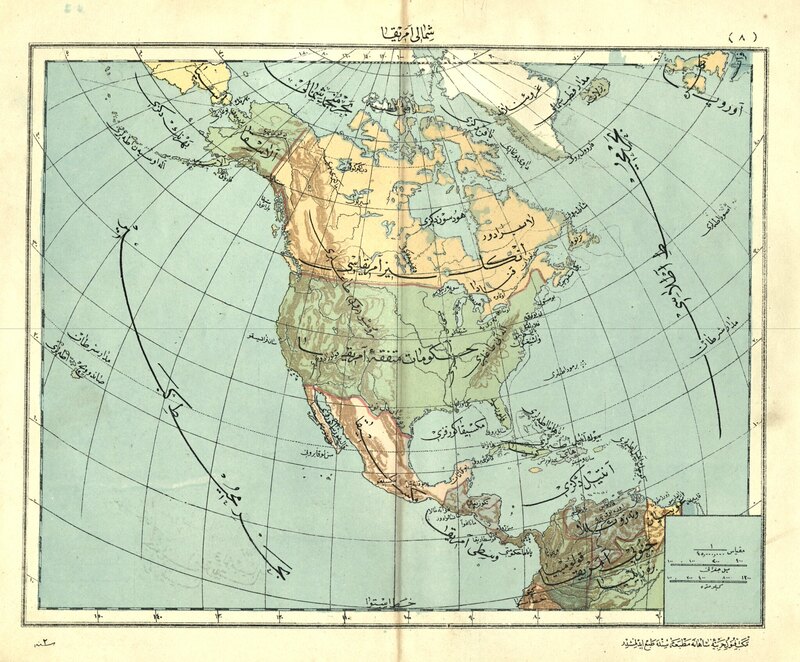 "At first glance, a map depicting “British America” might seem confusing. One’s immediate reaction might be to write-off this cartographic anomaly with the easy explanation that everything that lies east of the Pacific and west of the Atlantic is somehow classified as America in some capacity, whether it be North, Central, South, or even United States of. "While this general assessment is true, it doesn’t explain the difference between British America, and what looks like a hilariously diminutive Miniature Canada featuring the fledgling cities of Ottawa, Montreal and Quebec City in the same map. The crux of the real explanation is that, much like our southern neighbour[sic], modern-day Canada is a construct of several struggling and fragmented settler colonies unified over several wars and protracted negotiations which existed in various incarnations of statehood before resulting in the hockey-and-poutine-lovin’ country that we know and fear today. "As every good Canadian citizen who didn’t fall asleep in Grade 7 History class knows, Canada was originally settled in the late 15th century by European fur traders looking for beaver pelts to make fancy hats from, and subsequently carved up into rudimentary colonies. The British claimed Newfoundland and modern-day Ontario, and the French settled the creatively-titled New France (now known as Quebec and the Maritime provinces). All the boring bits ranging from the Hudson’s Bay basin through to the west coast were amalgamated as a separate colony called Rupert’s Land. The colony was nominally owned by the Hudson’s Bay Company (which made its fortune in the fur trade), and named after the obviously narcissistic first Governor of the company, Prince Rupert of the Rhine. For the benefit the non-North American readers, the Hudson’s Bay Company was a government-like semiautonomous corporation-state, much like the British East India Company. "New France was eventually ceded to Britain in all its stinky cheese and maple syrup glory soon after the conclusion of the French and Indian War (otherwise known as the North American extension of the Seven Years War), more commonly referred to as the Anglo-French Rivalry in Canada because we don’t like words that make us feel funny inside. Notably, an undeniable consequence of the Anglo-French Rivalry was the depletion of British resources which aided succession efforts during the American Revolutionary War (so you’re welcome ‘Murica!). In 1791, the colonies were united in two separate provinces: Upper Canada (English) and Lower Canada (French) roughly based on their geographic position along the basin of the St Lawrence River. The provinces were subsequently merged into the Province of Canada following the Act of Union in 1841, which is what is illustrated in this map above, as are the separate colonies of British America (in this instance, Rupert’s Land) and British Columbia. This brief period came to an end after the signing of the British North American (BNA) Act in 1867, an occasion widely regarded as the founding of modern Canada as we know it today, which re-fragmented the Province of Canada into its pre-1841 states, namely: Lower Canada (renamed Quebec), Upper Canada (renamed Ontario), New Brunswick and Nova Scotia. Subsequently, the British American colony of Rupert’s Land was annexed to Canada as the North West Territories in 1869, and the west coast colony of British Columbia joined the Canadian confederation in 1871. *No beavers where harmed in the making of this blog post, but sadly not in the founding of Canada."